Drive-In movies at the Britannia drive-in theatre in Ottawa, Canada. Homepage. This page: Head down to the Britannia theatre in your automobile for recent (and not-so-recent) films. Drive-ins were popular attractions in North America and Canada after the war. The appeal of simply driving over to a nearby movie show, and remaining sat in your automobile while you and your lady/boyfriend munched on popcorn and watched a film, was obvious. 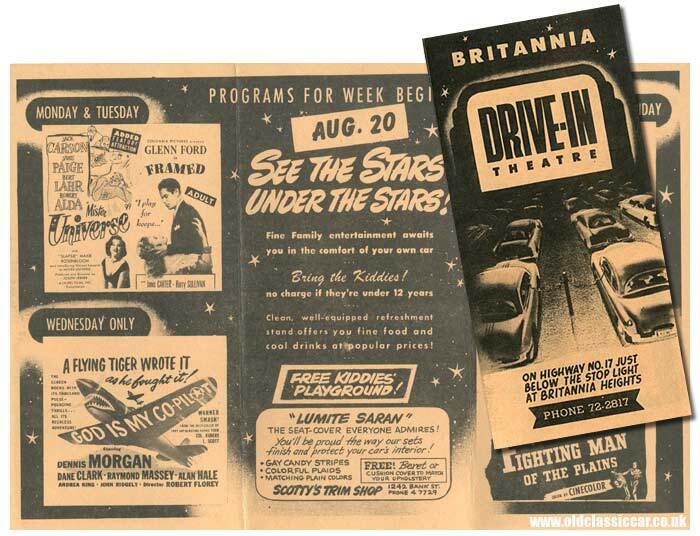 This leaflet promotes the Britannia Drive-In Theatre, situated on Highway No.17, ".. just below the stop light at Britannia Heights" in Ottawa, Canada. A map on the rear shows that the theatre was alongside Highway 17, close to its junction with Richmond Road and Highway 15. The Ottawa River was close by too. The cover shows an illustration of cars parked up, while their occupants enjoy a show. Poles can be seen between the cars, with cables leading into the cars on either side. Notes in the leaflet highlight some of the modern conveniences on offer at this drive-in, including individual car speakers, which presumably were connected to the cables shown. Other benefits included a clean modern bar, courteous parking attendants, and even a free baby bottle-warming service! You could even ".. come as you are - no need to dress up!" Unfolded, the leaflet describes the moves due to be shown week beginning August 20th. No mention of the year is given. The first films to feature ("Mister Universe" and "Framed", with Glenn Ford) are on Monday's billing, they date to 1951 and 1947 respectively. A check for Monday August 20th suggests that this could well be a leaflet from 1951. I had thought that the date of the films might help, but most were already a few years old at this time of this showing. Drive down on Thursday or Friday, to "See the Stars under the Stars! ", and you'd be treated to a playing of "Jolson Sings Again", a film from 1949, whereas on Saturday it was time for a Western, "Fighting Man of The Plains" (also 1949). The Britannia Theatre was created very much with families in mind, in addition to bottle-warming services, children under 12 could enter for free, and there was also a free kiddies' playground, where you could drop them off while you sat back to catch a flick. In addition to details of the movies due to play that week, there is also an advertisement for Scotty's Trim Shop of 1242 Bank St. Here he promotes his "Lumite Saran" car seat covers, something that apparently everyone would admire. They featured gay candy stripes, colorful plaids and matching plain colors. If you bought some of these covers, you'd also receive either a free cushion cover to match the upholstery, or a beret! Very dapper I'm sure. Does anyone know what happened to the Britannia? or have recollections of attending?